They all could have been someplace else. Like home, with their feet up on the couch and with the TV switcher in one hand and potato chips in the other. But for about 130 gray-haired “youngsters,” they’re here, with softball gloves on their hands, scooping grounders and chasing fly balls. 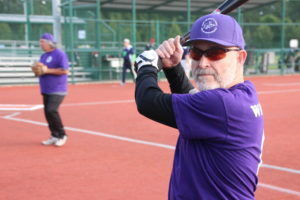 It’s here on Wednesday evenings at Lacey’s plush Regional Athletic Complex – the RAC – that these senior citizens are kids again, playing softball and having fun in the Olympia Senior Softball League. 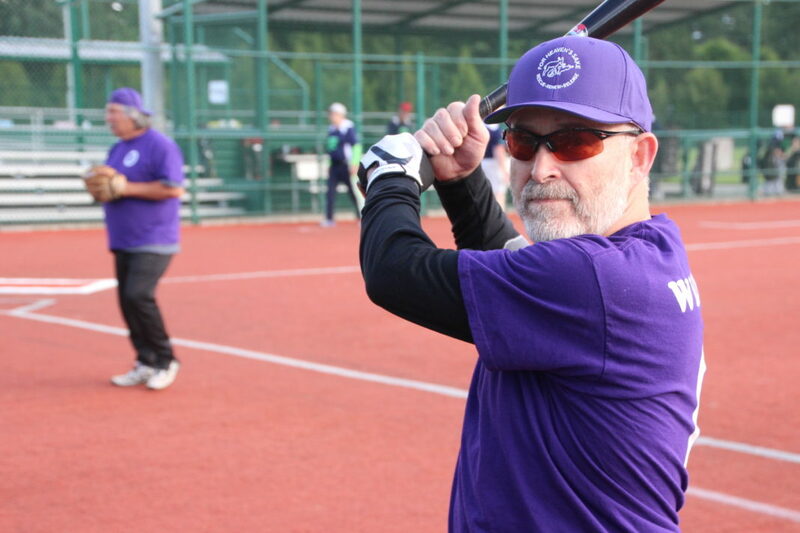 Sitting back isn’t a life choice for Byron Barrett and Victor Berube, teammates and buddies on the Wildlife team, one of 13 teams in the Olympia Senior Softball League. That meant Barrett was always trying to prove himself, prove he could he could do something. That mindset of “doing” has stuck around with Barrett, who is now 59 and still on the go. Interestingly, Barrett, unlike many of his teammates, doesn’t have a background of scooping grounders. He didn’t play baseball in high school while growing up in Kansas City, Missouri. He wrestled, earning a college scholarship to wrestle at Missouri State. Five years ago, Barrett got an unexpected invite to play softball while he was shopping at Costco. 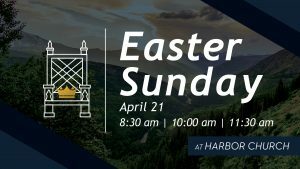 Barrett was wearing a Seattle Mariners shirt and that led to an unexpected invite. Dave Supensky, manager of the Wildlife team and a walking, talking definition of gumption, invited Barrett to play on the softball team. Like Barrett, Berube doesn’t have a scoop-the-grounders background. In high school while growing up in Maine, Berube didn’t have time to play sports. When Berube asked to play on a Little League team when he was in grade school, his parents said he couldn’t. They didn’t have time to drive him to practice. But Berube knows that didn’t short circuit his career with the Boston Red Sox. “Even if I started when I was younger, I know I wouldn’t be that good,” he said with a chuckle. Back in 1979, Berube started playing softball on a coed team. Eventually, that led to the jump to the senior league and now at 67, Berube is still swinging, playing softball. 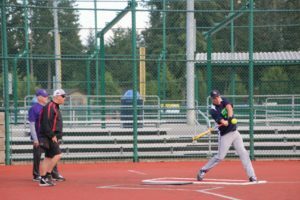 After working for Thurston County as a utilities technician for 35 years, Berube retired and softball is his gateway to fun. Doug Darmody, who is 57 and plays second base on the Wildlife team with Berube, did have a baseball background before picking up softball. 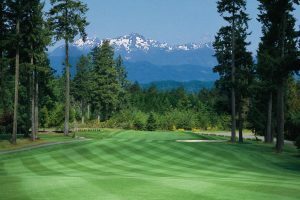 He played at North Thurston High School back in the 1970s and played a little junior college ball. Now, he’s swinging for fun. Exercise is part of the deal. Darmody knows that he can ride his stationary bike at home and do pushups at home, but he’s by himself. It’s more fun getting a workout with friends. Nobody knows the saying “use it or lose it” better than Supensky. 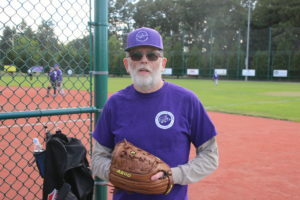 Now 80-years-old, he’s still not listening to that inner voice that whispers: “You’re too old.” Supensky, who runs the bases smoothly and still chases down grounders with ease, doesn’t let age be an obstacle. But it’s not an accident that Supensky, the oldest player in the league, is still in good enough shape to race down to first base after lining a single into left field. He exercises on a regular basis. By doing, he continues to do be able to do. That’s his secret. He’s going to pass on the potato chips and TV switcher. “I don’t want to do that yet. I’ll wait until I’m 90,” he said with a laugh. 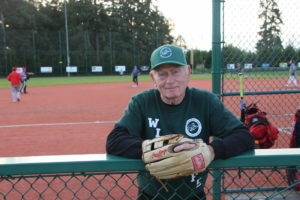 Pete Boeckel is a coordinator of the Olympia Senior Softball League. And he’s also a player. It’s an opportunity Boeckel, who turns 59 this month, doesn’t want to miss out on. It’s been their secret to having fun and staying in shape.